The Rolls-Royce of the FDT 3.0 family, Enterprise, was released a couple days ago. This probably isn’t news to you anymore but I thought I’d mention it anyway. The newly released Enterprise version brings more advanced refactoring tools + a similar-to-Flex-builder debugger, both of which are very welcome additions. FDT 3.0 Enterprise sets you back 599€ for the full version (roughly $950) so make sure you try the product in the 30 day trial to see if it’s worth that much to you. Check out Carlo Blatz’ present the new features of FDT 3.0 Enterprise. My tool of choice, FDT 3.0, has been officially released. No more beta! I was in the beta test program and it has been very exciting to see the progress of this wonderful tool. As I said before, if you haven’t tried it out; please do so. There’s a free 30 day trial too. FDT 3.0 packs a whole bunch of features which put the older 1.5 to shame (I won’t even try to compare it to flash, or even flex builder). Features include advanced code completion, an automatic formatter, quick fixes & assists, templates, organizing imports & automatic importign, launchers, semantic highlighting and much, much more. The biggest one though is definitely AS3 support which works like a charm. In short, it has changed the way I work. If Actionscript is the language that brings the bread to your table, go give FDT a spin. I was kind of surprised to see the split into different versions. While I understand this step as a good “excuse” to make some extra cash (which is well deserved), i find it kind of annoyed. I own a license for FDT 1.5, which I bought when I read that the upgrade will be 99€. Now, however, I’m reading this is just for the basic version which is kind of disappointing. 599€ for the enterprise version is still quite a bit more (i definitely want the debugger and advanced refactoring tools). I’ve been working with FDT for quite some time. There’s no going back to any tool I’ve ever tried (then again I haven’t worked in Flashdevelop, which many developers working on Windows recommend). Still, FDT is awesome, it has changed the way I work. I simply get more error free code out in less time. Now FDT3 is now open beta, meaning anybody can try it right away! If eclipse is your tool of choice, go give it a test drive. FDT3 will be 299€ or 99€ when upgrading from 1.5. Looks like Creative Suite 3 will be released in about 3 weeks, on April 20th! Canada’s Amazon has put up info about the CS3 package with images of the boxes (which are really pretty! ), with the info we want to hear: “Availability: This item will be released on April 20, 2007″. 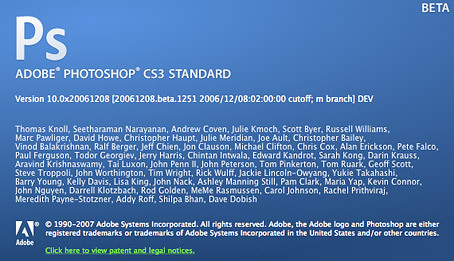 Now that we know the prices, release date, ui (photoshop cs3 beta) + icons and what’s included in each cs3 package, i guess it’s just the waiting part that’s left. 3 – long – weeks .. Yes, you read the title right. It’s out, since yesterday (just didn’t have time to write about this, due to my flight to finland). This is especially good news for us Intel mac users, since the beta is universal. A windows version is of course also available. I’m not going to write a full scale review or whavetever of the new version, since I haven’t had the time to experiment with it so much yet. Still, I gotta say the new interface is really smart. It scales according to your needs, and doesn’t have any loose palettes, similar to the After Effects 7 interface. All palettes can be accesses with one click of a button, so you don’t have to navigate in the window menu, or remember shortcuts anymore. You really gotta try it to see what I mean. Another interesting feature is smart filters, which work like adjustment layers. You can change the options later on. This is great when working with filters on for example photographs. Sweet! Other sweetness such as improved 32-bit image handling is also available. A new feature, open gl zoom, which will be included in the final release, is missing from this beta. Update: It’s blazing fast. Oh man, you really don’t need to wait for anything. Also it as loads and loads of really smart features. This is a much bigger upgrade than cs1 -> cs2! Been doing some small photo manipulation and graphics for my new site, and I can say I’m really noticing the difference! Now I’m just hoping for a similar release for Flash and After Effects. Great work from Adobe, again. Today I, Arwid Thornström and Joel Larsson participated in the Expo C conference at the marine museum of Karlskrona, Sweden. The conference was about software development and testing, which isn’t exactly my area, but was still very rewarding, since several big figures in the software industry spoke about their methods of development. These methods can of course also be implemented in for example flash development. After Helena Ola’s (Ericsson) brief introduction Jimmy Nilsson (JN System Konsult) took over and spoke about TDD, Test-Driven Development. He has a background in .NET development and gave a couple very good examples that illustrated easily what he was talking about. With TDD you test your code all the time, which makes it a lot easier to avoid bugs. I’m sure I’ll try to implement these ideas in my flash development. Flash of course isn’t as advanced or widespread (not to mention the different targetgroup & use) as .NET when it comes to coding, so development tools and frameworks are pretty limited. With some googling I found Actionscript 2 Unit, which apparently can be used in a similar way (the website didn’t work at the time of writing) as the framework Jimmy used during his presentation. I’ll look into that when I have the time. Hope they’ll get that site online again..
After this Dr. Aybüke Aurum from the University of New South Wales, Australia spoke about maximizing product value in software development. Among other things she spoke about a study about decisionmaking in companies, conducted in several countries, mostly with telecommunication and IT companies. The whole speech was more business oriented, stating that the product value is not the cost of development, but the perceived customer value. Good point. Anders Sixtensson from Softhouse then spoke about a project management method called Scrum. This was pretty interesting and totally new to me. With this method, in short, the entire team split into about 5-9 person scrum groups who get a task and then work on it for 2-4 weeks and deliver their work. Each group has a scrum leader who works almost like a project manager, and is responsible for the group. The group meets every day for a short meeting, to see what has been done. The scrum leaders always meet after a sprint (the 2-4 week period). They then get new top priorities on the backlog and start working on new tasks. I can imagine this is a really nice way of working, as you as a developer can focus on one task and one task only for the sprint. No clients coming to say “no no no, let’s do this and this instead”. Of course this might lead into some duplicate work, but in the long run it’s supposed to work well. Anders also took an example project with 58 people working on it, and mentioned a project where over 1000 people had worked in scrum groups. So, apparently it also works very well with bigger projects. Definitely something to look closer into. Niclas Nilsson from Activa then continued on what Jimmy started earlier, except “taking it to the next step”: BDD, Behavior-Driven Development, a method of coding developed by Dan North. To describe the difference between DBB and TBB Niclas said a quote he had heard at a conference last year “if you just change the word from ‘test’ to ‘should’ in your test cases, people will suddenly understand TDD”. This of course can be a bit over the head, so he continued with explaining it more closely. With TDD you write something, then do a test that ensures what you just wrote does what you want. With BDD you decide what you want to do, and write it accordingly. My explanation of course is extremely simplified. You set goals using a story that defines the whole development process in tiny pieces. The story can also be understood by clients, projects managers and other less technical people as it usually is something like “Given X when Y then Z”. Niclas Nilsson’s blog post about BDD is good to read to continue on the topic. Daniel Häggander from HL&L Computer Systems then had a short session titled “Non functional demands – how do we catch the ofter implicit needs of the customer”. To end the day we had discussions in smaller groups, going thru some questions that were raised during the day. This gave a new perspective to everything said, as questions could directly be asked to the speaker, and more specific answers, with examples and more specific explanations were given. The images here are from the previous conference held earlier this year. I’m sure pictures from this conference will come to the Expo-C website anytime soon. All in all, even if the focus of the conference wasn’t exactly what I’m doing, it was really nice and inspiring. It will definitely help us when when we’re structuring work for developing the Crew 12 site. Applauds The entire conference was also extremely well organized, and I can definitely recommend it to anyone in software development or management. Yesterday (or officially today, according to Adobe’s blog post) Adobe Labs has released a new Flash Actionscript 3 based online application called kuler. This application is an online color schemer application designed both as a standalone application and to complement the creative suite. You can also save your schemes, view other people’s schemes, rate them and download the ones you like as Adobe Swatch Exchange (.ASE) files, to be directly used in CS2 applications, as well as other formats that can be used in specific Adobe applications. An interesting move from Adobe. Adobe Labs has released a public beta for a new sound editing software, called Soundbooth, competing closely with Apple’s SoundTrack Pro. The usage, however, is different, Adobe Soundbooth is targeted more towards creative professionals, and not so much audio pro’s. Adobe said that Soundbooth was designed from the ground up with the video and Web workflow in mind. While many professionals have to be able to manipulate audio, they don’t necessarily need the vast feature set that many high-end audio applications offer. For me this seems very nice, as Adobe Audition seems a bit overkill and as I use other Adobe products on a daily basis, the logic should be the same, making it easy for me and frankly, quite many others, to get into the product. Nice Soundbooth will be a very familiar application for Adobe’s customers , explained Shafer. Before this i wasn’t using firefox 2, mostly due to the lack of support for some extensions I’m using (for which I found a work-around later, but was too lazy to upgrade & fix..). Still, now this seems pretty nice, almost had forgot about it. Back then, with the beta (which was some time ago! ), firefox also crashed from time to time, now it seems pretty stable (using the en-us on OS X). Some nice new features here, especially microsummaries seem like a good idea to make websites more usable for the end user. Smart idea. Another feature that’s pretty handy for me is that you can configure your default feed reader. Then again of course anybody who’s reading this probably already knows about these .. Anyway, if not, read on about the rest of the new features here.